Although we rarely update that side of the site we love alternative board games on PixelBedlam. Gloom, Magic The Gathering, Zombies!!! and Munchkin being our personal favourites for games night. Although there was a digital release for Zombies!!! announced, it didn’t look all that and I’m not even currently bothered enough to go look up what stage it’s at in terms of release. Magic The Gathering has had numerous digital game releases each exceeding the previous in terms of its depth and design, the tablet version has been a particular favourite of mine. Now we have a new game to add to the collection, Shelter from Survivalist Games. 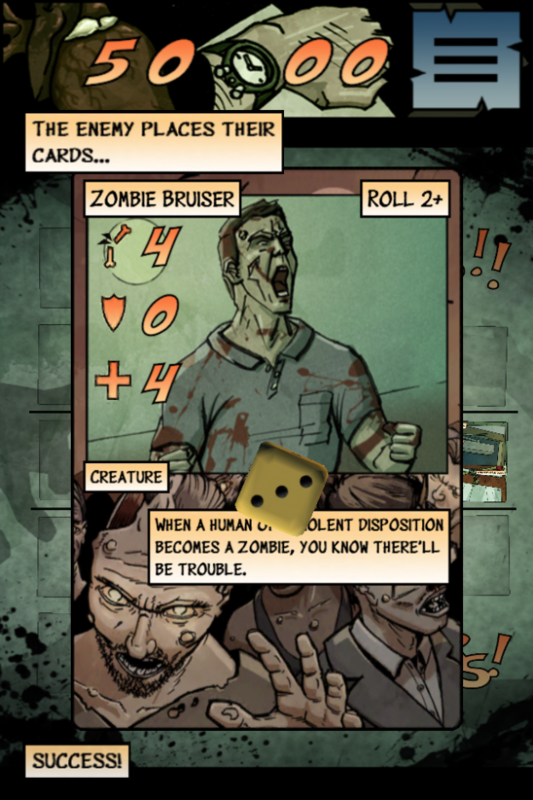 Shelter is a card collection and management battle game wrapped up in a graphic novel style and design. To be honest if that alone doesn’t grab your attention then I’m not sure what else I can say, for me, that was all I needed to dive in head first into this game. Then I encountered an issue, something I wouldn’t normally admit to because I come out looking silly but I feel this may affect others. This game is only really suitable for iPhones and iPods (of the more recent generations). I, as I do with all my reviewing, installed the game on my iPad 3rd generation and then realised on launching that it was displaying on a tiny screen in the middle, yeah you can do the 2x zoom and to be honest I actually forgot it was zoomed in after a minute or two and was able to play with what it turns out is an amazing art style and design choice. The only real reason I bring this up is because it confused me, you rarely see games that exclude tablets. I own an android phone so I wasn’t able to play this on its intended sized device. So with that slight hindrance in mind please believe me when I say this game is stressful fun and should be at least tried by anyone who has dallied in alternative board games or collectible card games. 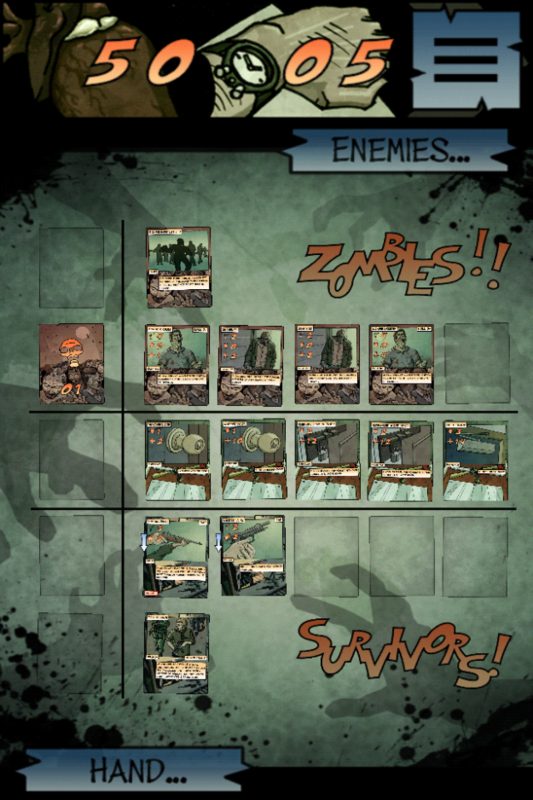 It’s all about numbers in this game, when you start you are treated to a few simple and quite focussed duels where you are given a set deck and the zombie horde kind of takes it easy on you. These build up your confidence no end and where as normally this is a good thing, in Shelter this just means that you’re lulled into a false sense of security before the game beats you over the head with a bloody cricket bat. The game holds your hand through these initial zombie meet and greets, the tutorials however are brutal, there’s so much information being thrown at you and retaining the intricacies is nigh on impossible. I found actually playing the game was a better way to learn, sure I wasted action points here and there and missed opportunities to kill the undead but this trial and error approach gave me more in a simpler way than any of the text boxes flying at me. The game is a lot like Magic: The Gathering, you have a certain attack rating and a defence/health rating on each card, as well as the weapons you have buffs and other survivors thrown into the mix all in all meaning once you are a couple of chapters in your are rolling in cards and quite easily able to develop a relatively interesting and individual deck. The basic concept is Attack Vs Defence, this, with some external factors, all contribute to how the duel is going to play out. You only have a set number of action points for each turn so you must think wisely as to how you’re going to move forward with the fight. One nuisance is the confusing way of ending a turn happens, the turn doesn’t end when you’re out of action points, you must instead go into the menu and select ‘End Turn’. This grows tiresome especially when tension is building in a big fight. The game is all about a man trying to get to his loved one on the other side of the country, to do this you must find vehicles, gas and food. 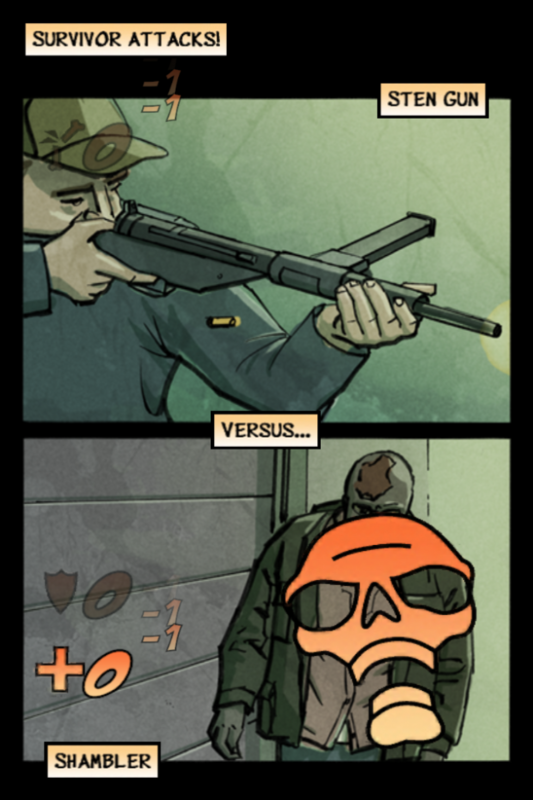 Each duel is essentially to see if you successful survive and scavenge each location. The map and cards are all presented in a brilliantly grim and relatable graphic novel style, the art is well used and different enough to make this game stand out. The soundtrack that plays behind all menu’s and gameplay is great the first handful of times, it’s a wonderful piece of dark tension building scoring, unfortunately it does repeat a lot and does make you wish that there was just a few more tracks equally as good. Overall this is a must for anyone who has ever played or wanted to play a Card Battling game like Magic or similar, the game although tricky at first doesn’t have all the overly complicated extra rules of other games and is presented in a great and original way. The fact that this is a zombie game worried me at first, it’s not like we’re short on them, but then I have to confess that this feels different. Just like with the Walking Dead, it’s given a different take on an over-saturated market and made the concept its own through presentation and its content. I genuinely hope that this game does great, it’s a great take on a genre that is well trodden but not often perfected. The only downside is some of the U.I. is just off and the fact it’s only on small screen iOS devices, something like this, with its art style, should be paraded around on as larger screen as possible, I can only hope that an “HD” version is announced before too long.